After 4 Years Of Siege, Civilians And Rebels Evacuate Syria's Daraya : The Two-Way Rebels agreed to hand over control of the city to the government in exchange for safe passage. This ends the years-long standoff in one of Syria's most desperate places. 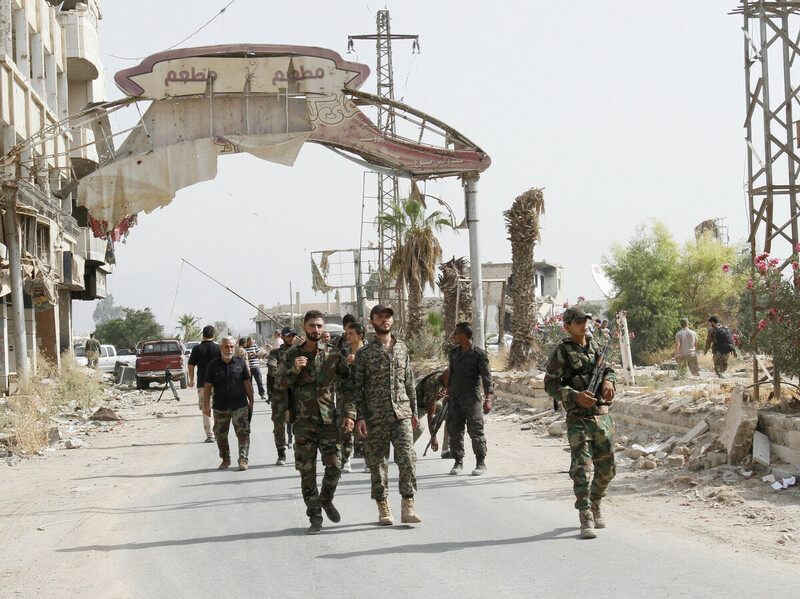 Syrian soldiers walk at the entrance of Daraya, a besieged Damascus suburb, on Friday. After four years of siege and bombardment, the evacuation is underway of civilians and rebels from embattled Daraya, southwest of Syria's capital Damascus. Rebels agreed to hand over control of the city to the government in exchange for safe passage. Under the terms of the deal, about 4,000 civilians will be transported to temporary accommodation outside of Damascus. Approximately 700 fighters will head to rebel-held Idlib after surrendering their weapons, according to Syria's SANA state news agency. As NPR's Alice Fordham tells our Newscast unit, some civilians "say they'll flee with the fighters, because they fear the regime." About 300 rebels and their families will leave for Idlib on Friday, and the remainder will leave on Saturday, a field commander told SANA. Daraya will be "free of militants tomorrow," he said. This ends the years-long standoff in one of Syria's most desperate places. "The town of Daraya was one of the first to kick out security forces in Syria's 2011 uprising," Alice reports. "That rebellion was all but crushed in 2012. But a few thousand clung on." She says an "unequal struggle" continued, with "starving civilians living in basements to avoid bombs." "When the U.N. sent a fact-finding mission to Daraya in May, officials were followed around by crowds of hundreds of civilians — including malnourished women and children. The U.N. estimates there are at least 4,000 civilians still there. Residents and activists say it is 8,000. These are the few who remain from a city that numbered as many as 200,000 before an uprising was crushed in 2012." The New York Times pointed out this tweet from activist Hussam Zyadeh. He "fled Daraya in 2013" and "summed up the ambivalence of ending the fight amid a feeling that the world had stopped caring and had provided no help." The newspaper added that "this agreement was the first in the Damascus area to envision a complete emptying of a town." And, "for people in nearby holdout suburbs, it was ominous." The United Nations says it was not involved in the negotiations that resulted in this deal, as The Associated Press reported. The office of U.N. Special Envoy Staffan de Mistura issued a statement "calling for the protection of people being evacuated ... and says their departure must be voluntary." It concludes: "The world is watching."